BHRE works closely with public buyers to develop best practices in public procurement with regard to human rights. As part of this work we have developed guidance and policy insights as well as organised several public events and delivered training. Below are some of the outputs of our work. We are working directly with public buyers and buyer organisations in the Higher Education and Local Government sectors including London Universities Purchasing Consoritum, Higher Education Procurement Association and the Local Government Association. With these organisations we have produced the materials below and our regular Greenwich Symposia on Responsible Public Procurement. BHRE, in collaboration with our partners LUPC and APUC, has developed an eLearning suite on Protecting Human Rights in the Supply Chain, developed especially for public procurement practitioners. The eLearning is designed for users to learn why protecting human rights in the supply chain is important to the public sector, how to assess and prioritise risks, monitoring supply chains, responding to abuses and measuring and reporting effectiveness. There’s also a module on compiling the annual Slavery and Human Trafficking Statement under the Modern Slavery Act specially focused on public buyers. The suite was written by Dr Olga Martin-Ortega and LUPC Director, Andy Davies FCIPS. To access the e-learning suite for free please click here and register your details. The eLearning suite is hosted by LUPC. LUPC will only use this data in relation to modern slavery communications and not for sharing with third parties. Preparing a Slavery and Human Trafficking Statement: Guidance for Higher Education (2018) by Olga Martin-Ortega, Anna Gorna and Patrycja Krupinska. We have created this Guidance in collaboration with HEPA to support Universities to comply with their duties under the UK Modern Slavery Act section 54, Transparency in Supply Chains. 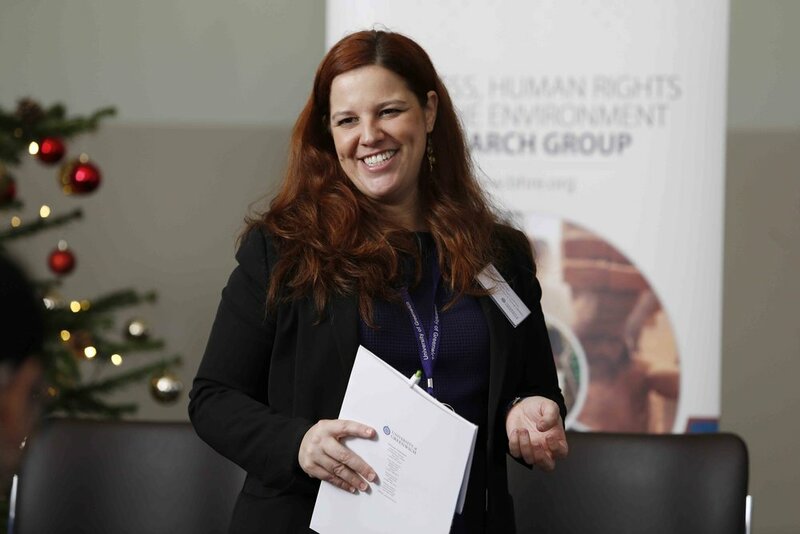 Protecting Human Rights in the Supply Chain. A Guide for Public Procurement Practitioners (CIPS, 2017). The Guidance, authored by Andy Davies and Olga Martin-Ortega, is published by the Chartered Institute for Procurement and Supply (CIPS) Knowledge. Written specifically for public procurement practitioners, the guide offers encouragement for buyers, decision makers and opinion-formers to identify and understand the risks, develop appropriate mitigating actions and promote respect for human rights in public supply chains. The guide sees a collaboration between CIPS and partners London Universities Purchasing Consortium (LUPC), Advanced Procurement for Universities and Colleges (APUC) and BHRE. The Guidance is available here. 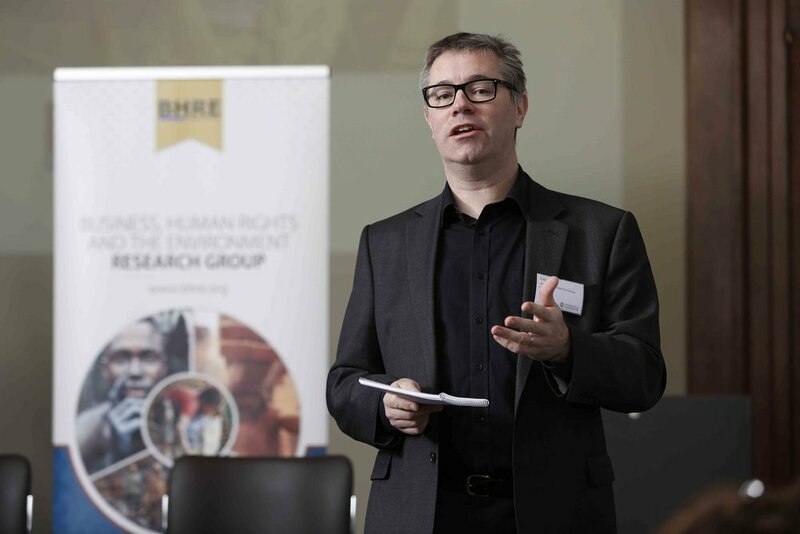 Modern Slavery and Human Rights in Global Supply Chains: Roles and Responsibilities of Public Buyers. Policy and practice insights for Higher Education Institutions in the framework of their obligations under the UK Modern Slavery Act. BHRE Research Series. Policy Paper n.2 (December, 2016). The policy paper is based on our research and interaction with civil society, public buyers and international policy makers in the context of our three successful stakeholder engagement symposia. Submission to the Australian Parliament Joint Standing Committee on Foreign Affairs, Defence and Trade inquiry into establishing a Modern Slavery Act in Australia on The Case for Extending Modern Slavery Obligations to Public Buyers: In April 2007 the International Learning Lab on Public Procurement and Human Rights submitted its written evident to the Australian Parliament Joint Standing Committee on Foreign Affairs, Defence and Trade inquiry into establishing a Modern Slavery Act in Australia. In particular, our submission supports the inclusion of a ‘Transparency in Supply Chains’ provision which applies both to corporations and public bodies and builds upon the experience, practice and research on our work on the first year of implementation of the UK Modern Slavery Act 2015 by UK public buyers. Symposium Modern Slavery, Human Trafficking and Human Rights Risks in the Global Supply Chain: Roles and Responsibilities of Public Buyers. 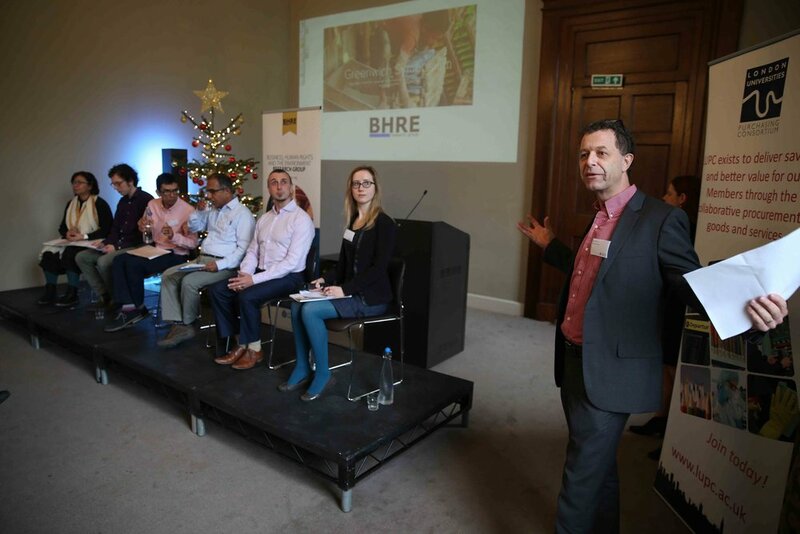 In December 2016 BHRE, the London Universities Purchasing Consortium (LUPC) and Electronics Watch organised the third Greenwich Symposium on responsible public procurement. This year we focused on Modern Slavery, Human Trafficking and Human Rights Risks in the Global Supply Chain. The event featured three round tables on: Labour Rights Organisations; Policy, Regulation and Advocacy and Public Buyers. Confirmed speakers include members of the labour rights organisations: Labour Education and Service Network (Hong Kong); Economic Rights Institute (Hong Kong); Civil Initiatives for Development and Peace (India) and the Multicultural Centre of Prague (Czech Republic). We were joined by international NGOs, including Anti-Slavery International and Unicef; as well as the UK Gangmasters Licencing Authority; the OSCE; the International Learning Lab on Procurement and Human Rights and a highly committed group of public buyers. Among them were Transport for London, LUPC, Advanced Universities Procurement Consortium, London Borough of Harrow, One Housing and Stockholm County Council. The programme is available here. Baroness Lola Young of Hornsey, OBE, delivered the inspirational keynote speech. Baroness Young Hornsey noted that less than 10% of the British population knows that there are forms of modern slavery and highlighted the importance of the Modern Slavery Act of 2015, the first antislavery legislation in the UK since the Abolition of Slavery Act in 1833. Section 54 of the Modern Slavery Act focuses attention on global supply chains. It requires any commercial organisation whose annual turnover is £36m or above to produce an annual "anti-slavery" statement describing the steps it has taken to ensure that slavery and human trafficking is not taking place in any of its supply chains or in any part of its own business. Expert presenters on the labour rights, policy, and procurement panels that followed Baroness Young described the key steps to end modern slavery, human trafficking and human rights violations in global supply chains. The labour rights experts, Electronics Watch monitors, consistently stressed the importance of freedom of association and a meaningful collective voice for workers. "The only way in which you can explain how wages are so low in Mexico is the lack of independent unions," said one. "Less than 1% of workers belong to a real independent union." An expert from India stressed: "Workers are vulnerable to human rights violations. They earn terribly low wages. They can't have a decent life. It's extremely important that workers' voices are heard and unions are recognised by companies in India." The public procurement and policy experts noted the importance of transparency in supply chains in order to impact human rights abuses. "Transparency is the main driver for change" said one. "Public buyers have to ask the questions. Brands need to know, and show that they know. We need to hold them accountable." They also stressed the importance of a combined hard-soft approach, enforceable rules, on the one hand, education on the other. "Criminalisation is important, but so is education and raising awareness," one panelist observed about modern slavery in the UK. And from a practical perspective, many presenters said that there could be no real solution going it alone. "Collaboration is key. If you have a policy and it's clearly stated on your website and in your tenders, then that's the first step. But, how do you actually get change? That's where collaboration is really key." To read about the event access our report and check the Public Spend Forum Europe blog which has featured a two part article (Part 1, Part 2) on it.